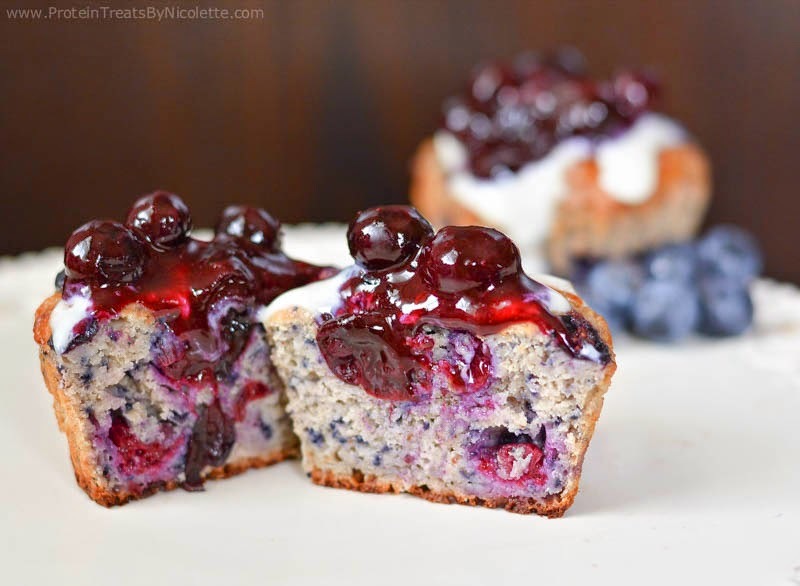 I love when you add blueberries in a batter to bake, whether it is a muffin, cupcake, or cake, they burst open adding a sweet and tart pop of flavor. 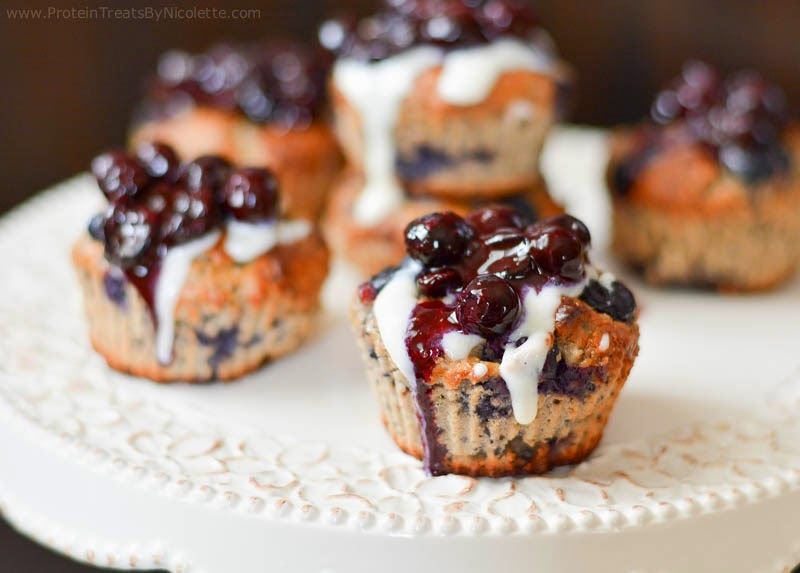 There are fresh blueberries blended into the muffin batter and more blueberries that are stirred into the batter right before baking. 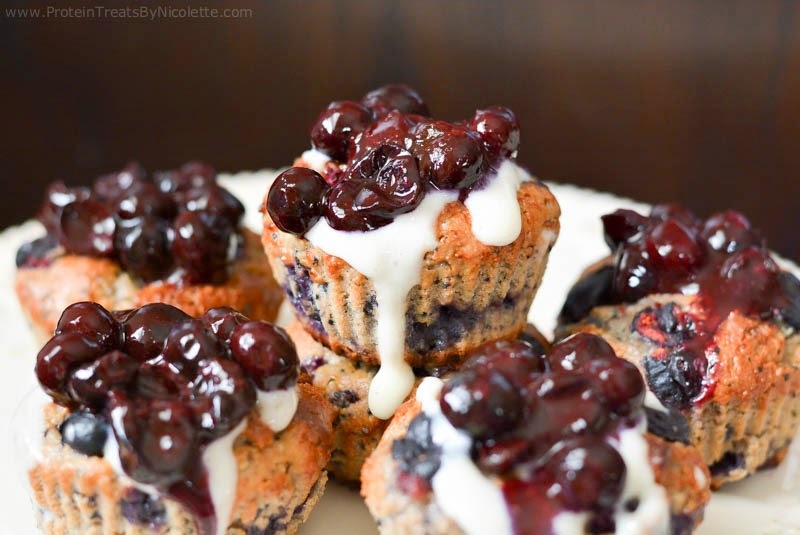 If you like blueberries, these are for you! They are also low in sugar and low in fat with an awesome 9g protein per muffin. Enjoy! 2. Add egg whites, ¼ cup blueberries, greek yogurt, and extract to a blender or food processor and blend until smooth. 4. Pour wet mixture into the bowl of dry ingredients and stir until well combined. Stir in the remainder ½ cup blueberries. 5. Evenly spoon batter into the 6 cupcake liners and bake in the oven for 18-20 minutes. 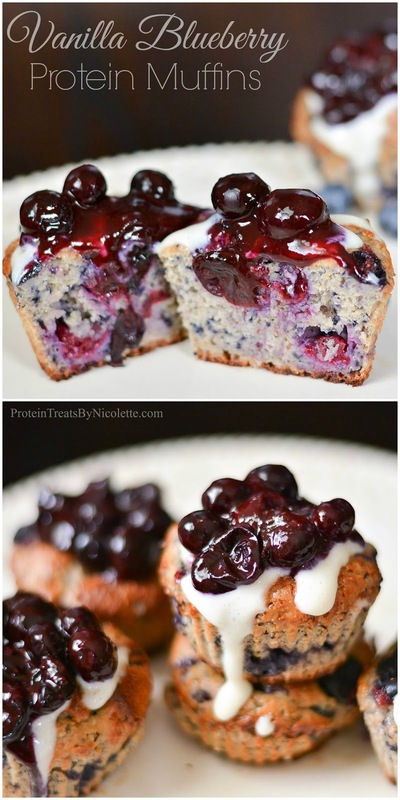 * I topped mine with homemade blueberry jam and a protein vanilla glaze. These muffins are so healthy whilst still being packed with such deliciousness. I definitely can see myself making the recipe! shake protein powder ... can you make the recipe without this, what is the purpose of the protein powder, other than to add protein, is it necessary? OK first if all these are AMAZING. the only thing Is I could not get them completely baked. I not very good at baking so am I doing something wrong? I want to keep making them so just wondering if there is a secret I'm missing? Thank you!! Oh no - you can try to increase the baking time a little bit longer. A trick I have is to stick a toothpick or knife in the center of the muffin when you think it's done. If it comes out clean, then they are done. If it comes out with wet batter on it, try a couple of more minutes then try again. I hope this helps! What kind of protein powder should I use? Whey or plant based ? What is the recipe for the protein glaze you used? Could I use whole wheat instead of almond flour?